This has to be the easiest recipe ever. It is also my favorite way to serve Asparagus. Squeeze the lemons and pour the juice into a little pitcher. Lightly steam the Asparagus spears until crisp-tender. Lightly toast thick slices of bread. (At this point, if you like, you can cut one Garlic clove in half, and simply rub the cut side quickly over the warm toasted bread. It's amazing how the Garlic melts its delicious fragrance and taste lightly into the toast.) Melt the butter slowly over low heat so that it does not brown at all. Pour the warm butter into another little pitcher. 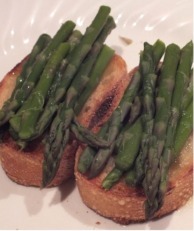 Place the Asparagus spears on top of the toasted bread like a flatbed of logs. Once the platter or individual plates are served, take the two little pitchers and pour equal parts of melted butter and fresh lemon juice over the Asparagus spears. The combination bite of the sweet Asparagus and the butter- and lemon-soaked bread is ambrosial.